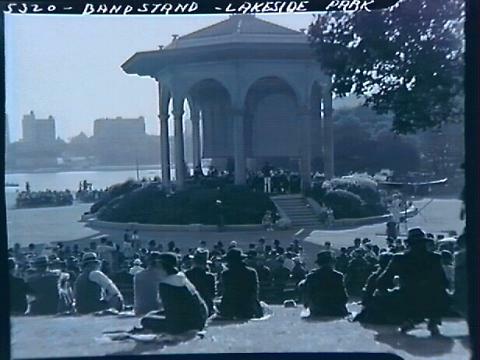 A close-up view of the bandstand at Lakeside Park during a band concert in 1936. Spectators are seated on the grass and there is a view of Lake Merritt and downtown Oakland in the background Betsy Willcuts, March 2002 Bibliography: THE HEART OF OAKLAND, A Walking Guide to Lake Merritt by Leslie Flint, Sponsored by the Camron-Stanford House Preservation Association The bandstand known as the James P. Edoff Memorial Bandstand was designed by Oscar Prager and finished in 1918. Bibliography: Celebrities At Your Door. Verbarg, Leonard H. From Oakland Tribune, July 5, 1964. James P. Edoff was chairman of the Park Commission in 1918. He took a strong interest in the band and in the park. Paul Steindorff, appointed by the Oakland Board of Park Commissioners in 1912 to organize the Oakland Municipal Band, and his wife took a picture of a famous bandstand in Milan, Italy in 1914. 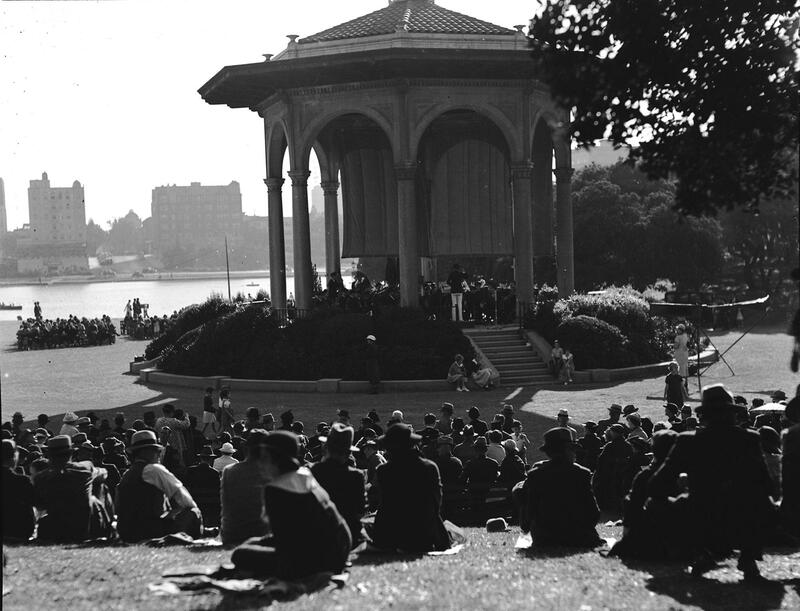 The Park Board patterned the Lake Merritt bandstand after the one in Italy. The bandstand has been the band's home since its dedication in 1918.